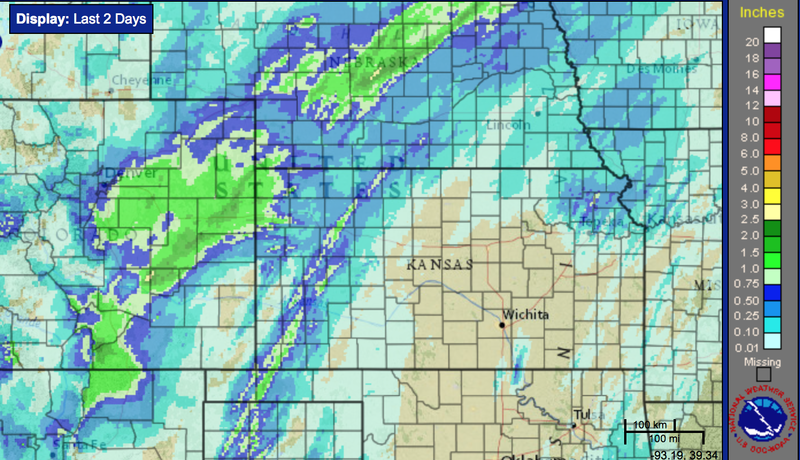 Here is the regional actual precipitation from the time it began in Colorado about 30 hours ago. Okay, because we are now in planting season (soil temperatures rising) and I personally know people who are planning to garden this weekend, here is another update on rainfall prospects for the next ten days. 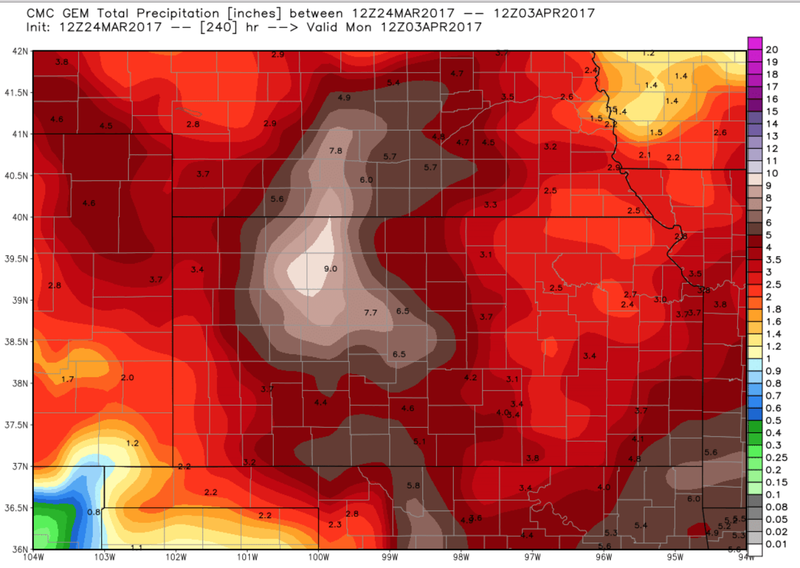 For reasons not well understood, the GFS typically is drier in its Great Plains forecasts produced from the morning data which again seems to be the case here. The other two models have turned wetter compared to last night's and yesterday's forecasts. 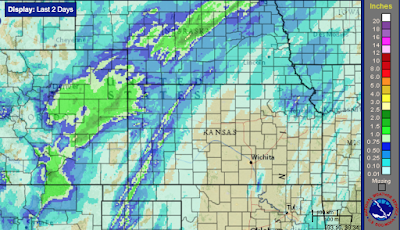 Yes, that is an 8+" area in northwest Kansas. Do not take any of the specific details of these forecasts too literally as illustrated below. 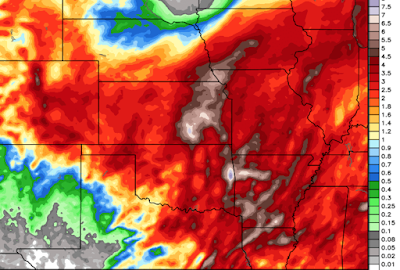 The ECMWF has forecast, like the CFC, some excessive rainfall in Kansas. 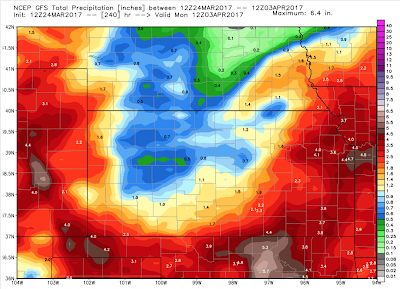 But, this time, their forecast is for it to occur in the southern Flint Hills rather than northwest Kansas. Again, do not take the details literally. The takeaway from these forecasts is that moderate to heavy rains will fall over most of this area the next ten days. 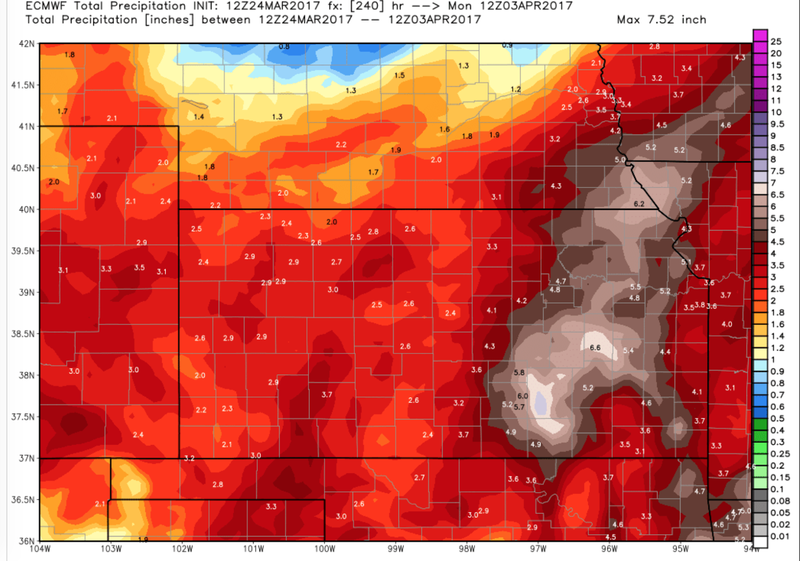 Because the ECMWF is the usually the best of the three, here is the latest rainfall forecast for the entire region for the next ten days. So, gardeners, farmers and ranchers -- use this information in a way that is most useful to you. The great news is that the long-forecasted rains have arrived and will continue for a while!